Lately we have been addicted to watching and listening to stories online. 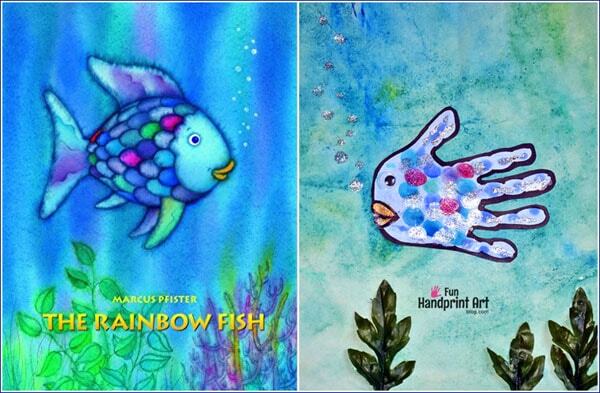 One of favorite is the adorable kids book the rainbow fish. The rainbow fish is a must-read if you have never read it. 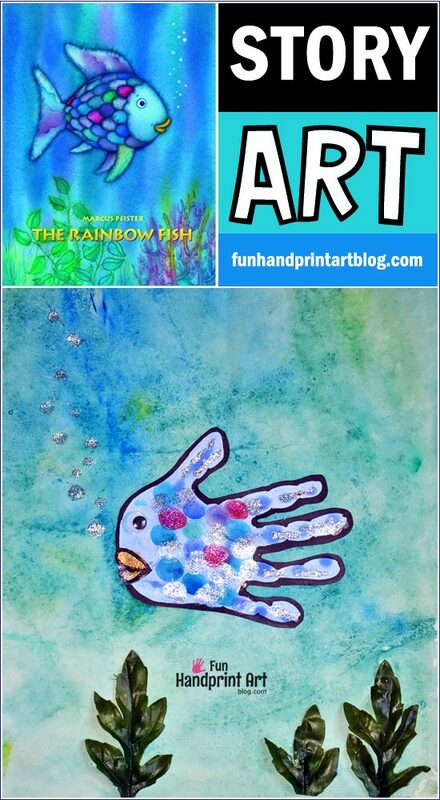 To go along with the book we decided to make a rainbow Fish handprint craft. 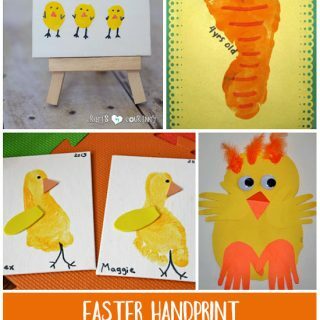 It makes a great craft for preschoolers and kindergartners. At the end of the post are even more ocean crafts from our blogging friends! *Please note that this post contains Amazon affiliate link to the products mentioned. Please read our full disclosure policy here. This is a cute story with a great lesson. The most beautiful fish in the ocean has shiny scales that sparkle and shimmer. He is lonely and unwillingly to share when a little fish asks for one of his beautiful scales. Eventually he learns to make friends by sharing his most prized possessions with the other fish. Kids will learn the beauty isn’t always on the outside as well as feeling good about making others happy. 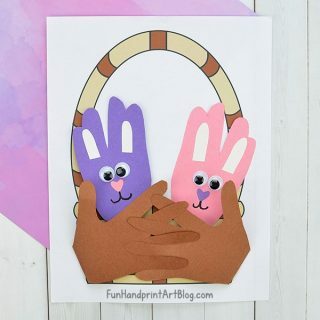 You can choose to use tempera paint or watercolors for this craft. We started by placing a dot of the blue watercolor on a small plate with a little bit of water added to it. Little sister dipped her hand into the paint and then made a print on the paper. On a separate sheet of paper, we made the ocean water background. Big Brother did this part! He painted the entire surface of the paper with water and then brushed on blue, yellow, and green watercolors. Once the page was completely covered, he went back over everything again with the water. To make a fun texture, he sprinkled salt all over the page and then set it aside to dry. When it dries, brush the salt off. Once the fish dries a bit, it’s time to make the fish scales! On a small plate, place a dab of dark pink, green, and 2-3 shades of blue. Make fingerprint fish scales being sure to leave space for the beautiful, shiny scales. Place dots of silver glitter glue in those spaces, Press down with the tip of your finger to make a sparkly fingerprint. Add steaks of the glitter glue to the tail and fin. Make glittering bubbles leading up to the top of the page. Use orange glitter glue or paint to create the fish lips. Once dry, cut around the handprint. Trace around the edge with a black marker. Glue to the ocean background. Add on a googly eye. Add things such as seaweed, other fish/ocean animals, stickers, and so on. 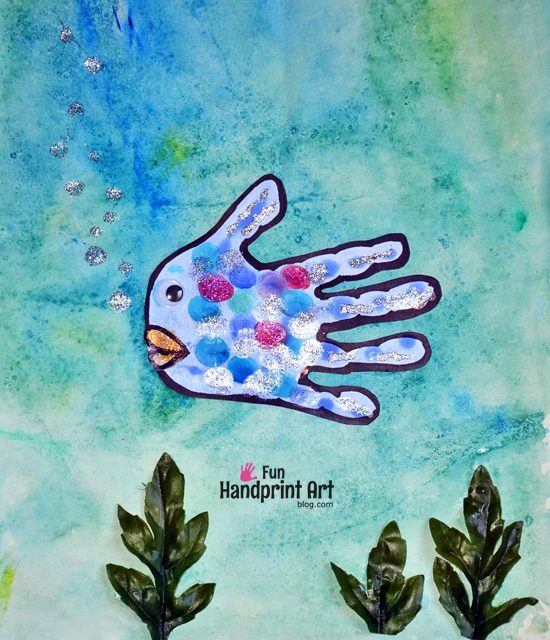 → See more ways to make a handprint fish. Join us every month for a new crafty challenge. This month’s theme is ocean crafts for kids. Stop back next month for another fun theme! Follow the Kids Craft Stars on Pinterest and IG (#kidscraftstars) to stay updated with our most recent crafts and more! Beside The Rainbow Fish, what other ocean themed books do your kids enjoy? Happy to hear that you like it 🙂 It’s such a cute story!